Frugal & Fabulous: ChapStick MixStix Prize Pack Giveaway! ChapStick MixStix Prize Pack Giveaway! It's no secret I love ChapStick! I have one in just about every bag, coat pocket and on both my desks! 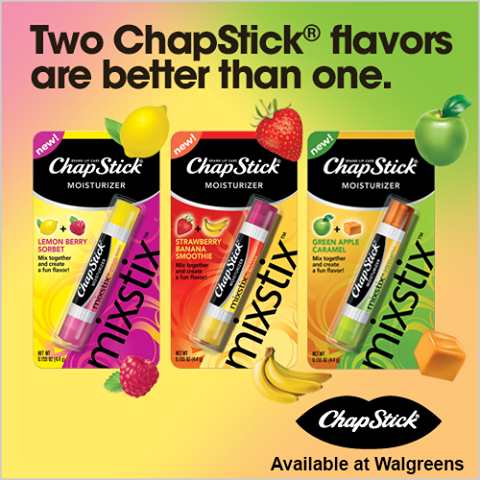 So I'm so thrilled to share with you ChapSticks MixStixs - their new two sided lip balms! Wear them together or separate - but either way you'll enjoy these fab new flavors: Strawberry Banana Smoothie, Lemon Berry Sorbet & Green Apple Caramel! My favorite is the Green Apple Caramel - the Green Apple is tangy and delicious and the Caramel side is sweet and rich tasting! Whether it’s singing along to your favorite tunes pool side or gearing up for the family BBQ, make sure you Apply Healthy™. Apply Happy™. These fun MixStix flavors are available exclusively at Walgreens retailers nationwide! *Disclosure: The ChapStick® product, information and gift have been provided by Pfizer Consumer Healthcare. All opinions are my own! Green apple caramel - love green apples and love caramel so this has to be a winner! i would like to try green apple carmel, it sounds yummy! Strawberry Banana Smoothie sounds great! Thank you for the giveaway! Lemon Berry Sorbet sounds yummy! I'd love to try the Lemon Berry Sorbet. I'd most like to try Strawberry Banana Smoothie. Thanks.